The remarkably inventive sculptor Nathaniel Robinson makes technically impressive, philosophically provocative works that play in the gap between perception and cognition — between what you see and what you understand. Among this exhibition’s beautifully made works is a life-size representation of a sidewalk mailbox lying on its side. Stripped of all extraneous details and colored entirely powder blue, it has an almost immaterial quality; it’s a Platonic ideal of the standard mailbox. In a similar vein are large, sculptural reliefs representing old walls made of stone and brick, measuring about 6½ feet by 7½ feet. Although realistically textured, they’re also colored pale blue, so that they seem to exist between realms of earthly, material reality and archetypal, immaterial form. 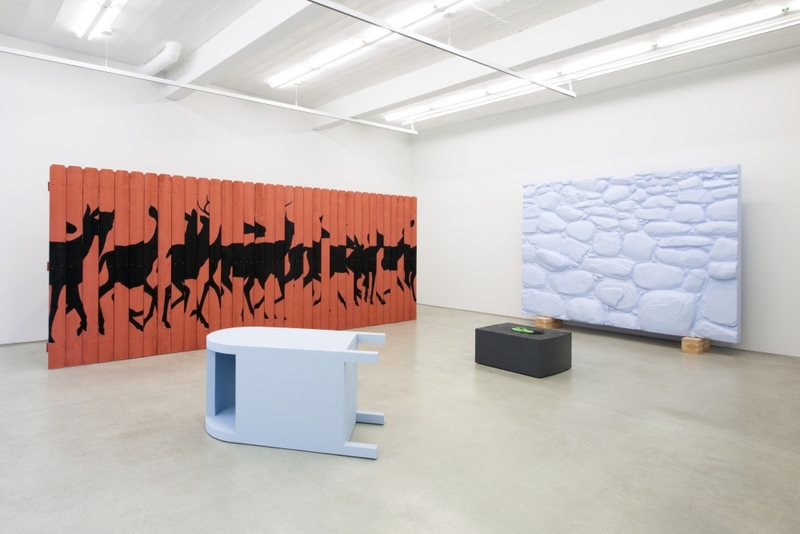 Relating to those walls is a rustic wooden fence 6 feet high and 16 feet wide made of palings stained barn-red and painted with black, fragmentary silhouettes of deer. It seems that at a prior time the fence displayed coherent deer shadows but that it was dismantled and then rebuilt with the imagery scrambled. Seen thus, there’s a curious, flickering effect, as if you were glimpsing a herd running past your car’s headlights. In an opposite direction, Mr. Robinson has created two blocky objects, both called “Freeze/Thaw,” with smooth sides and tops super-realistically representing sections of weathered pavement. They look as if they’ve been surgically excised from city streets. One of these has a bright-green, rubber flip-flop — actually carved from wood — hovering over a pothole. The sandal looks as if it’s floating on water, but there’s no water in the hole. It’s magical.